Bitter and dark as my black, black heart, at least Force of Evil is fiction. My introduction to Force of Evil was the supplementary materials on the Criterion Collection laserdisc of Raging Bull. Besides providing a wealth of production notes and hand-drawn storyboards, Scorsese also pointed out which older films had influenced the look and tone of his film. Remember, Scorsese once taught film at NYU and possesses a near-encyclopedic knowledge of the art form. He revealed that he had directed two specific scenes between the LaMotta brothers in Raging Bull as homages to similar scenes between two brothers in Force of Evil. This started my search to see Force of Evil. For a period of time, it was seldom shown and very difficult to see. I finally caught a screening at Chicago’s Music Box Theatre, which I often call “the happiest place on Earth.” The film blew me away, and it quickly became my favorite film noir; I got into the habit of seeing it whenever it returned to the Music Box. 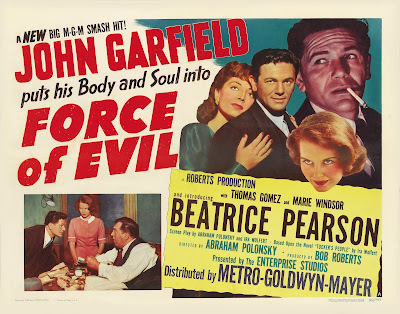 I do not know why Force of Evil is not more often discussed in critical studies and books about film noir. I wonder why some films make it into “the canon” of certain genres, while others are lost to history. Don’t get me wrong, I believe that Double Indemnity, The Postman Always Rings Twice, and Out of the Past deserve their places on the Noir Wall of Fame; I am only suggesting that there is room on that shelf for Force of Evil as well. It may have something to do with the fact that writer/director Abraham Polonsky was blacklisted soon after the film was released. He was one of the “unfriendly” members of the Hollywood Ten and refused to “name names” during the House UnAmerican Activities Committee hearings. Refusing to testify effectively ruined his career, and he would not direct another film for 21 years. A committed Marxist who joined the Communist Party in the 1930’s, Polonsky’s politics inform every frame of Force of Evil. Like Francis Ford Coppola’s much later film, The Godfather, Force of Evil is a critique of capitalism couched in the outer trappings of a crime melodrama. As such, I marvel at how clearly it speaks to our current political malaise between the 1% and 99% and the aftermath of the Wall Street bust of 2008. I find a bitterly ironic connection between the plot of this film and the fate of the Hollywood Ten. One of the film’s less subtle messages is that, in America, only mid-level and low-level criminals are punished. 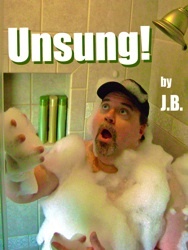 The people on top remain untouchable and are seldom asked to pay any dues, regardless of their wrongs. Abraham Polonsky was a mid-level writer and director who refused to testify and ended his career. Elia Kazan was a superstar, “named names,” and went on to win an honorary Academy Award. THE PLOT IN BRIEF: Crooked lawyer Joe Morse (John Garfield) is the number two man and muscle behind legitimate businessman Ben Tucker (Roy Roberts). The two hatch a scheme to bankrupt all of New York’s smaller bookies and policy banks and to place them squarely under the thumb of Tucker. Morse realizes that this plan will make him rich, but would also ruin his brother Leo (Thomas Gomez), a small-time bookie. Morse desperately tries to save his brother, but as in most noirs, the fates of both men are sealed. The performances in Force of Evil are terrific, all the way down to the smallest supporting role. 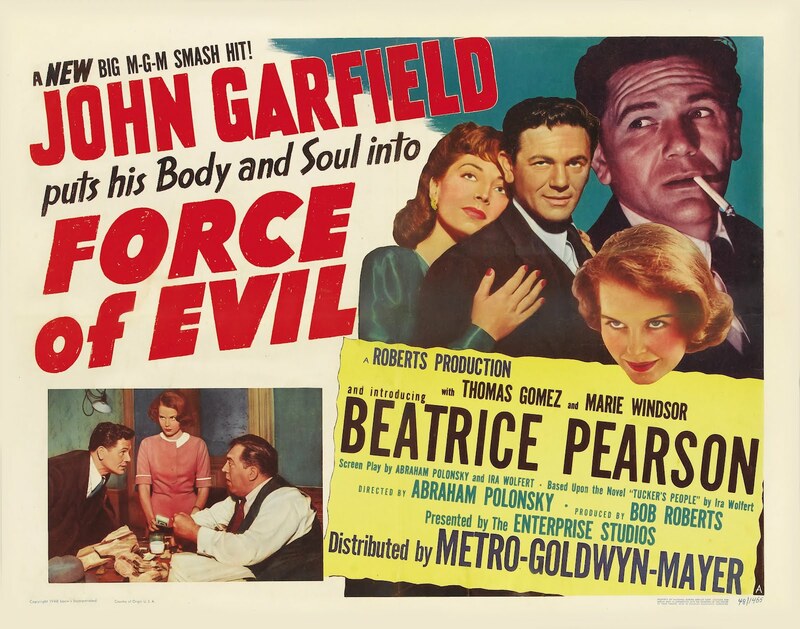 While most critics would suggest that Garfield’s signature performance can be found in Body and Soul (also scripted by Polonsky), I would give the nod to Force of Evil. Garfield’s performance here is more low-key, less flashy, but full of subtle nuance. Watch for the number of emotions he conveys during his scenes with his boss’s wife (Marie Windsor.) The standout performance of the film, though, belongs to Thomas Gomez. Usually typecast playing Mexican bandits and itinerant Italians, Gomez here gives the performance of his lifetime, imbuing Leo with the tragic sense of a man who never quite lived up to anyone’s expectations. Gomez has one particular scene in a little restaurant, where he feels that gangsters may be coming to kill him, that is one of my favorite movie scenes of all time. Tension, tragedy, and trenchant observation are all there, etched on Gomez’s sweating mug. Polonsky and his cinematographer George Barnes took advantage of many real New York locations at a time when very few Hollywood films ventured far from Los Angeles. The film captures the feel of the city; it has such an uncanny sense of specific place that the city, in the words of the well-worn cliche, becomes a character unto itself. Perhaps this is one of the film’s elements that first attracted lifetime New Yorker Scorsese to the film. Every office, every alley, and every hallway seems chosen to amplify the film’s mounting tension and dread. I cannot say enough about the film. While it is not your usual Hollywood exercise in escapism, it has a rawness and maturity that I respond to. It is as if the filmmakers felt their audience could handle an insightful glance into the way the world really works -- a vision darker than even other late 1940’s film noirs presented. Force of Evil is making its debut on Blu-ray today. Trust me, friend, you will not regret buying it... or stealing it.